Bazaar's General Store is a store ran by Bazaar in Donkey Kong Country 3: Dixie Kong's Double Trouble!. It appears in the southern area of the Northern Kremisphere map. It is located just west of Wrinkly's Save Cave (changed to Wrinkly's Retreat in the Game Boy Advance port). At Bazaar's General Store, Dixie and Kiddy Kong can buy from two items (three in the Game Boy Advance port), or purchase from two bits of advice regarding a specific subject. 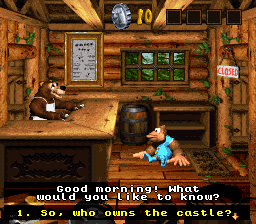 The items sold by Bazaar are necessary to exchange for a Banana Bird if brought to another Brothers Bear. Bazaar continues to sell the advice even after the Kongs have bought it. Although it is never available for the Kongs to purchase, Boomer apparently purchases a fan from Bazaar's General Store after the Knautilus rises in Krematoa. The fan is absent from the Game Boy Advance port. This page was last edited on April 9, 2019, at 16:53.